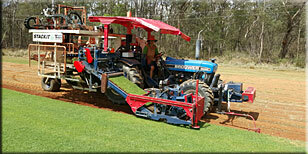 A good choice for domestic lawns, sports fields and golf courses. Wintergreen couch is a soft fine to medium leaf grass and has a luscious soft to the touch fine leaf cover. Ideal for areas that are subject heavy use or in full sun. Wintergreen is very robust and exhibits rapid recovery after damage or high wear. Winter green establishes easily with minimal maintenance, and low water consumption. A dense light green leaf lawn that will require mowing every week during the growing season, but is resistant to pests and weeds, requires minimal fertilization and will tolerate a wide range of soil types / conditions. Wintergreen is not suited to shaded areas or to cold climates. Minimum Order for Delivery is 60m² Smaller orders can be placed but Pickup ONLY. Total order must be paid for in advance. Price does not include laying or delivery. Please email us for a free quote before ordering.